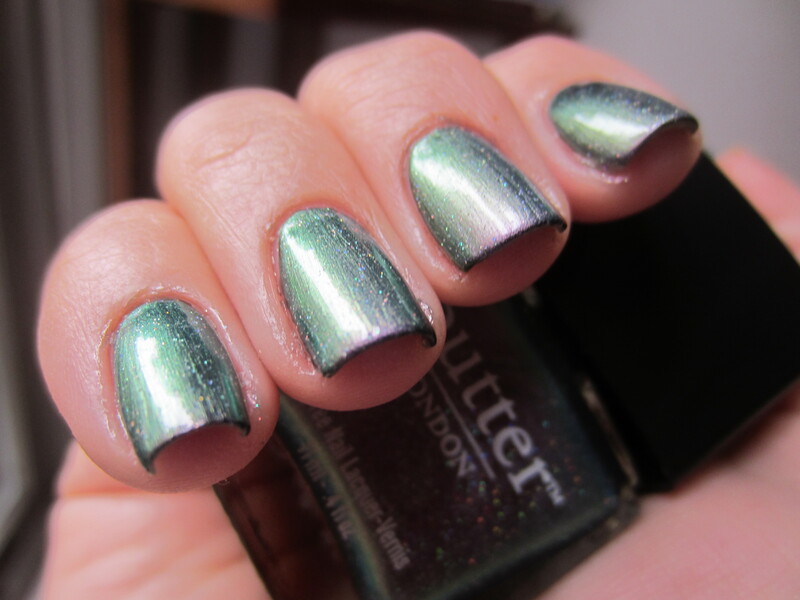 My second polish from Coterie! This was the polish that was last to go into my cart. I actually debated about this polish for the longest time, going back and forth between this and the other 3 polishes to choose from. The other 2 polishes were “Pillar Box Red” and “West Side Wonderland”. I finally talked myself out of the other two and went with this one. I really didn’t think I was going to like this polish. 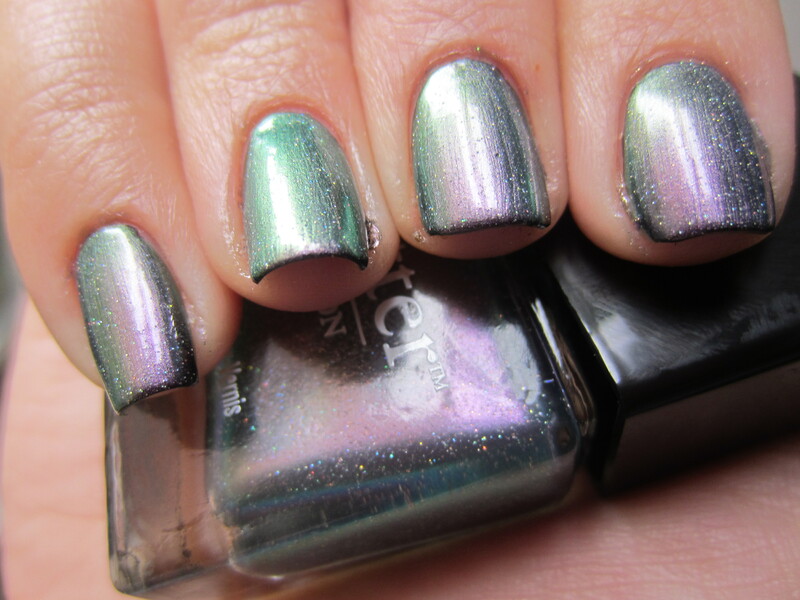 I have several grey polishes that have a purple and green type duochrome, and I don’t wear a single one of them. Also, I heard awful things about this formula. So I wasn’t excited about this polish, but I already had dupes of the other two. Surprisingly, I ended up liking this one the most out of the three that I picked up! 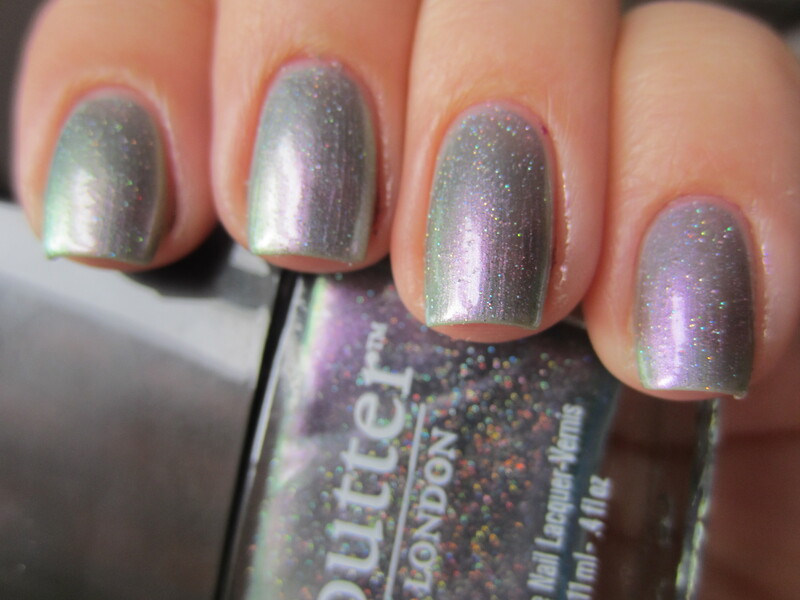 Butter London “Knackered” is a grey metallic that has a purple and green duochrome. The color shift is much stronger in this polish than in the other duochromes that I have that are the same color (aka OPI “Not Like The Movies”). But this color is also much lighter than the other grey/purple/green duochromes in my collection. 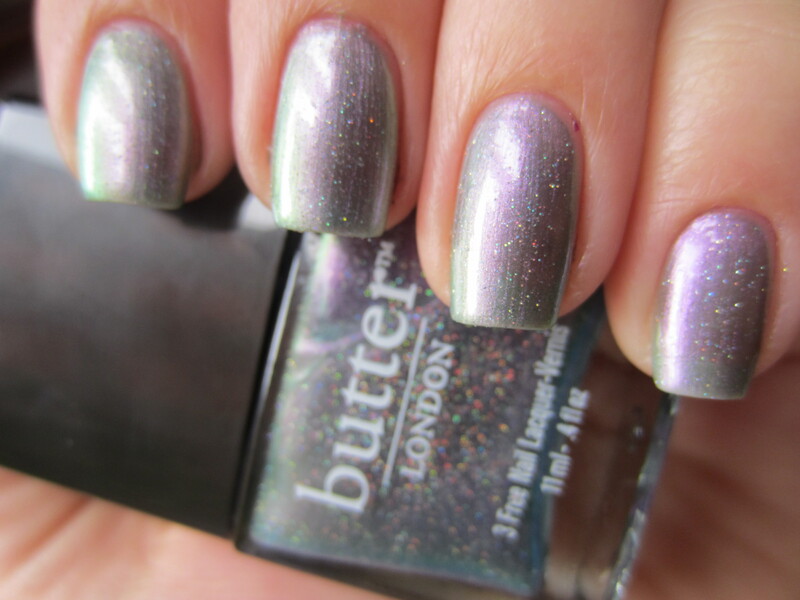 What makes this polish so special is the holographic microglitter in it! 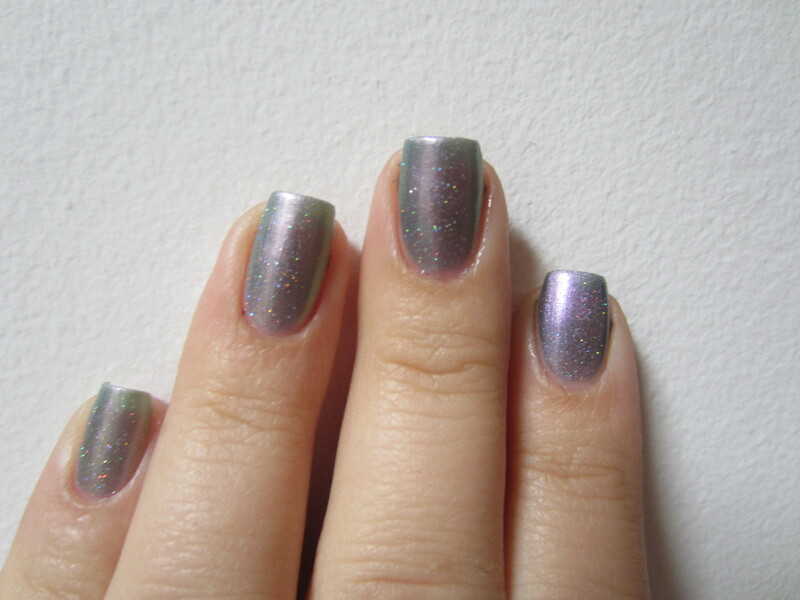 The holographic glitter definitely is visible and shows up nicely, but subtly on the nails. Formula wise, this is a sheer polish. I knew it was going to be sheer because I heard all about that from other disappointed bloggers. This is 3 coats and I can still see visible nail line. This polish also had a slower dry time. 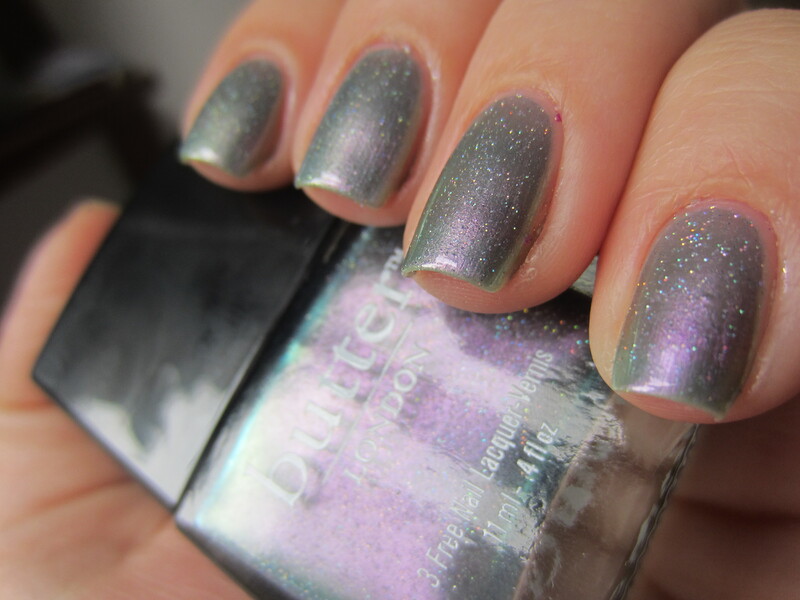 But since it was so sheer, I purchased it mainly as a layering polish. So I had to try it over a ton of different colors to see what it would be like! Be prepared for a photobomb! 3 coats, on its own. 3 coats, on its own. I think this picture shows the polish the best of how it looks in real life with all 3 colors and the holographic glitter. 3 coats, on its own. This picture shows the VNL and the holographic the best I think. 1 coat over 2 coats of black. 1 coat over black. This picture really shows how strong the duochrome is. 1 coat over black. 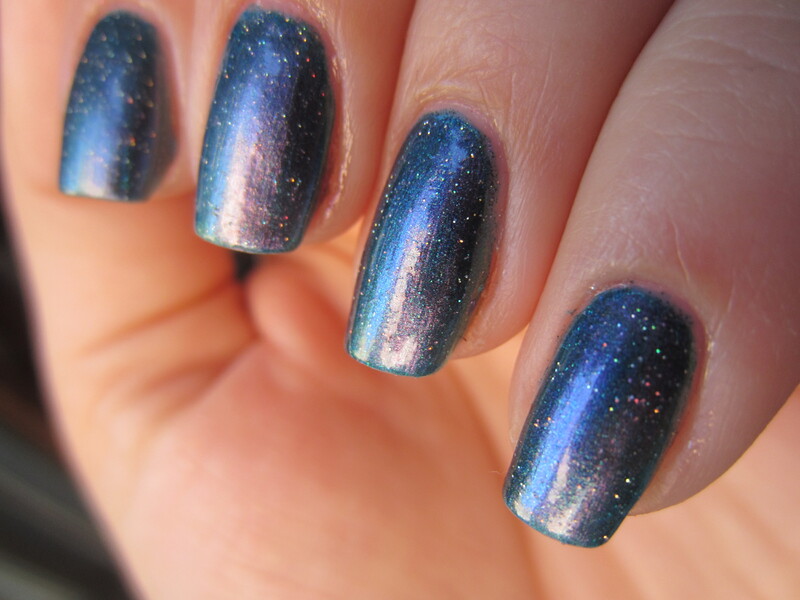 This picture shows what the polish looks like when you’re just looking at it and not trying to see every color. You can see that Knackered is sheer and subtle but adds a nice glitter and sheen to the nails. 2 coats over white. I really didn’t like it over white! 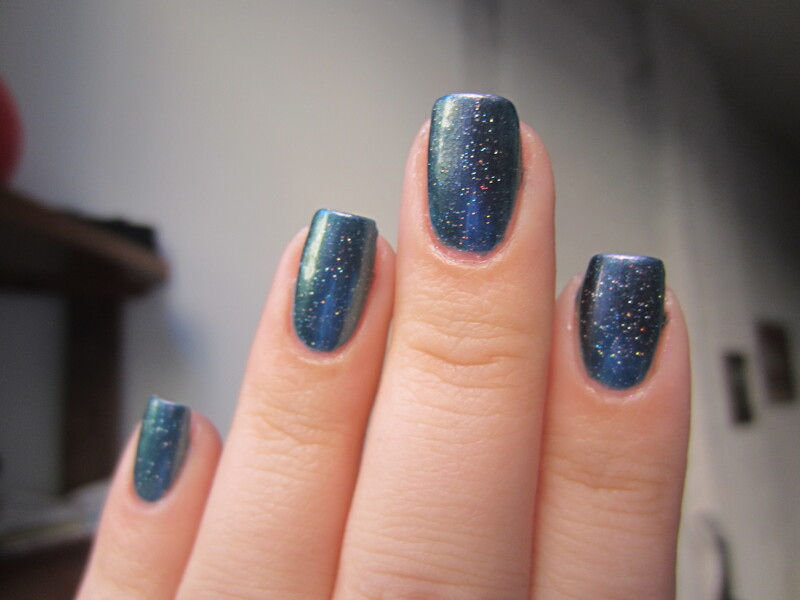 It brought out all the streaks and made the polish look almost gritty because of the holographic glitter. Also I lost a lot of the duochrome-ness. It looked more greenish grey than a duochrome over white. 2 coats over white. It took 2 coats to get the color even over the white. Ok, photobomb finished. What do you guys think? Which color combo was your favorite? Do you have Knackered? How do you like to wear it? ← This is Halloween Nail Art Challenge: Ghosts! 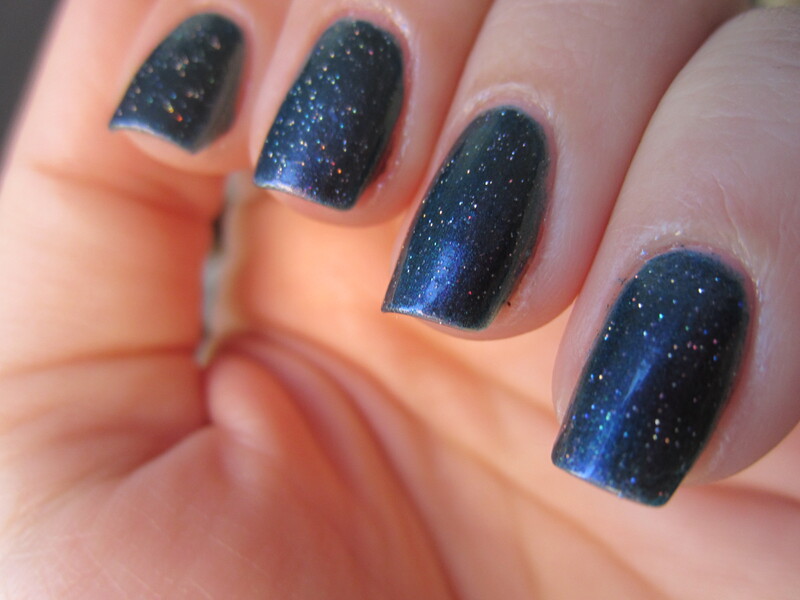 I put it over China Glaze Secret Peri-wink-le – I love the combo. oh that would be an awesome combo! i might have to try that one tomorrow! have you tried them yet? what do you think? New follower of yours here. I have this polish and was HATING it because I don’t have a good black to wear under it… and you know it is awful on its own. Anyway, I am so incredibly happy that you posted this. It looks amazing over bluey!!!! Now I can use knackered again! Thank you! I can’t wait to try it over a dark purple like OPI Ink. Aaaaaaah! Thank you, thank you, thank you! I have knackered, but its sitting in my untried pile. My friend put it over Essie School of Hard Rocks and it looked great!